If you live in the Boston area and ride public transit, you should check out this iGoogle Gadget that makes tracking buses easy. You can set up to 3 stops (perhaps near your home/work) and it will show all the latest arrivals in real-time. Note that it only serves a few lines currently (click here to see the list of lines served). 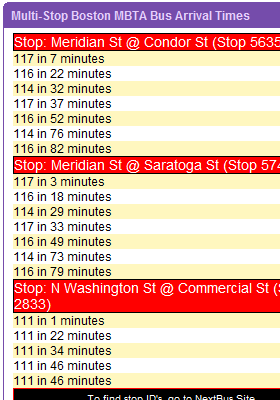 The number of lines/stops served will increase as MBTA adds more tracking services. Once you have added the gadget to your homepage you will see instructions on how to add stops. You can click on the link at the bottom of the gadget to search for stops (on the NextBus website). If you like the gadget you can use the link at the bottom of the gadget to give feedback or promote it (on Twitter, Facebook, your blog, etc…).